Everyone these days tries to rank their site’s content higher in Google Search results. There are marketing firms earning a good deal of revenue in relation to the most notorious digital term these days, “SEO”. In this post I will be explaining the different aspects of “On Page SEO”, how to deal with it in WordPress using one of the best free plugins: WordPress SEO by Yoast. This is a series of tutorials, in the first one we will be configuring and understanding different sections of the WordPress SEO Plugin. Future tutorials in this series will be about different aspects of SEO, how to utilize your site’s Tags & Categories, the concept of rel='canonical', a practical example of an SEO optimized post, and finally some discussion about what else you need to do after having this plugin configured. This tutorial will help you in optimizing your WordPress sites with the most popular aspects of On Page SEO. 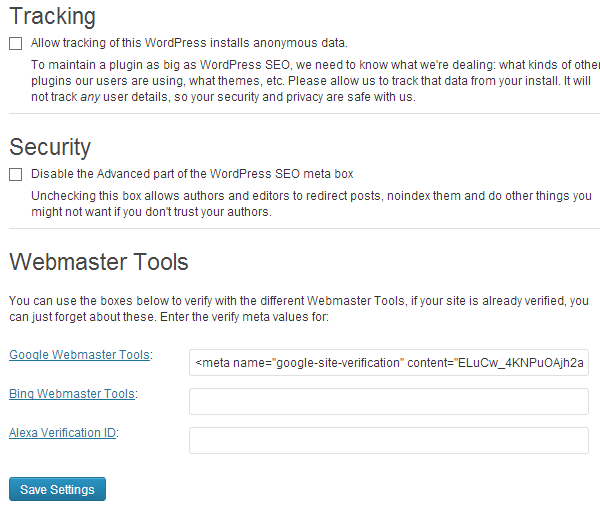 Today our goal is to configure this WordPress SEO plugin and to understand the meaning of each step. Why the plugin WordPress SEO By Yoast? I believe it is the best and most complete SEO plugin available for free, though not as easy as AIO SEO, but it comprises of certain vital SEO modules which are the results of the vast experience of Joost de Valk – An elite WordPress developer who developed this plugin. First of all head over to your WordPress admin panel and install the plugin named WordPress SEO by Yoast (Go to Plugins > Add New > Search for WordPress SEO By Yoast > Install it > Then activate it). 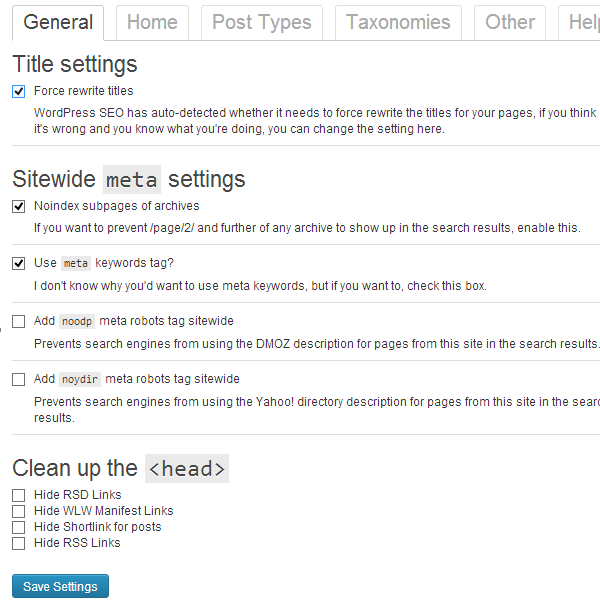 After activating the plugin, if you observe the left side menu, you will find a new panel introduced with the name SEO, just like the one in the image below. 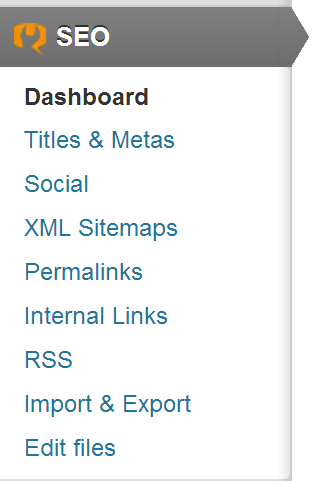 When you click it you will be inside the Dashboard of the WordPress SEO plugin. Here you can take a tour or restore the default settings of this plugin in future. More over you will find Tracking and Security check boxes. It allows the author of the plugin to track issues with the plugin if there are any, in future. If you are concerned about your privacy you should keep it unchecked. This option, if checked, will disallow your Editors and Authors from redirecting a post to another URL, which is one of the capabilities of the plugin. Checking this will also forbid them from no-indexing your posts. If you don’t trust your Editors and Authors, this option should be checked. These tools allow you to easily verify your site’s ownership by using the meta code provided by Google and Bing Webmaster tools. This option can also help you in verifying your site for Alexa (if you have their premium subscription). You can see I have filled in the Google Webmaster’s meta code. Tip: Using Google & Bing Webmaster tools help you in understanding the behavior of your site (how much your site is linked, 404 errors, page speed etc). After you are done with these configurations you can press the button saying “Save Settings“. This option means that the WordPress SEO plugin needs to change the title tag of your installed theme, so that it can modify it as per your settings. This option should normally be ticked. No-index subpages of archives: It should be checked as it helps your homepage to retain its importance, your Homepage is one of the most important parts of your blog. Use meta keywords tag: I prefer to check it, as the Search Engines like Yahoo and Bing are known to give some importance to these meta keywords. These are the keywords around which your article is based. Add noodp meta robots tag sitewide and Add noydir meta robots tag sitewide are used if your site is present in DMOZ or Yahoo Directory, sometimes Google prefers the description of your site from these directories, enabling these tags can help you remove this kind of error. There is a theory that Google prefers a clean head. Most of the SEO Analysts suggest to keep your site’s head portion clean, the top most links which the Google bot reads get more importance. I don’t prefer hiding these links, as in RSD, WLW Manifest Links and shortlinks of your WordPress posts are helpful in a way like if you use Microsoft Live Editor to Publish your posts then hiding these links is not preferred. If you plan to clean up the head of your blog anyway, I would recommend you check the first three options and leave the RSS links option unchecked. Why? Because RSS links are read by certain plugins and can get you more subscribers. Some people say these RSS links are valuable assets for your blog. Enough said! Click the Home tab inside the plugin and you will land on the page where all the settings of your Homepage can be found. These settings are kind of ‘set and forget’ settings. You can see the character limits in the image below, fill according to your domain name and niche. Description: 160 characters in which you will use your focused keyword once. e.g. If your site is for a book shop, you can include the term Buy Books here. Meta keywords: Don’t spam this box, just put 5 to 6 keywords here, and you should put long tail keywords here, e.g. Download Books at Cheap Rates, Cheap priced Books Downloads etc. After that, go to your profile page from the top right corner of the Admin Bar, fill in the Google+ URL of your profile and select your name from the users list at the Home Tab of the WordPress SEO plugin, so that your thumbnail is displayed with the exact domain name in Google’s Search. It is due to the rel="author" attribute that WordPress SEO adds this to the header with your profile link. This helps you get a good deal of exposure and more clicks. 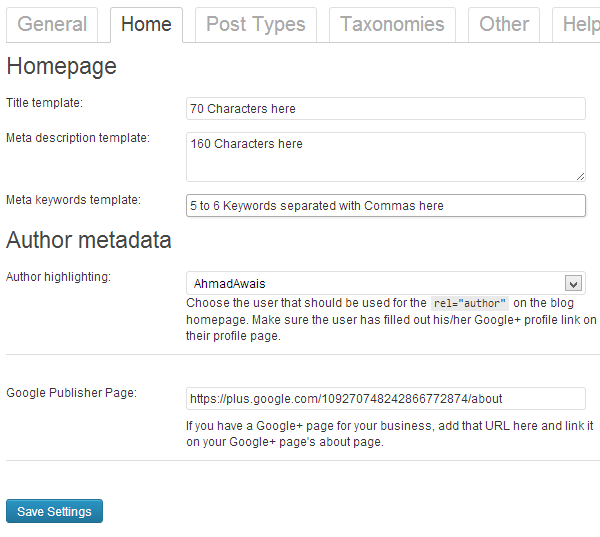 Make a Google+ page for your blog and add the URL in the box at the end, so that rel="publisher" can be added. These two rel attributes are important for your On Page SEO, and help your site rank better. After all these settings you need to click “Save Settings”. Then click the Post Types tab where you will generically configure the On Page SEO elements for Posts, Pages and Media files. The Help tab provides the details about these generic tags we are using here, but I recommend you do it the way it is done in the image below. Why? After experimenting for about three to five years, I have found these settings best. Of course, we are not going to no-index the posts, but if you tick the Meta Robots No-index then search engines won’t index your posts. Either you check the date snippet or not, if your theme supports the date tag then Google will include it in its search results. I find the date factor very important in On Page SEO, though you can find contrary suggestions about this factor from a lot of people. %%title%% Replaced with the title of the post/page. %%focuskw%% Replaced with the post’s focus keyword. %%tag%% Replaced with the current tag/tags. %%category%% Replaced with the post categories (comma-separated). %%excerpt%% Replaced with the post/page excerpt (or auto-generated if it does not exist). 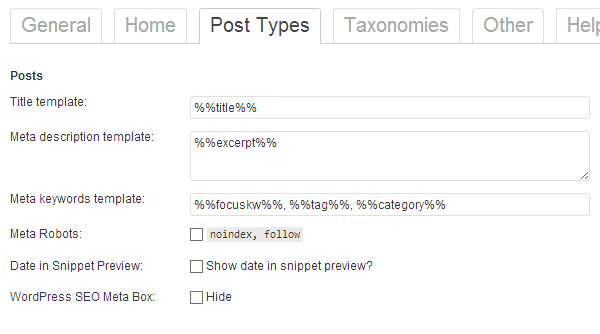 The WordPress SEO plugin allows you to configure the On Page SEO parameters for taxonomies like Categories, Tags, Formats and any Custom Taxonomies, if you have them. Normally Categories are used to categorize the content into organized form, and tags are used to put more aliases for a single post. Right now our focus is towards the configuration of WordPress SEO by Yoast, so we will skip this discussion, but you will read some details about this in next tutorial of the series. I don’t index both of them so that Search Engines should give most importance to my main article’s titles instead of Tags or their Categories. Here are the settings, if you see I have checked Meta Robots Nofollow so that the Google bot never indexes them. Same goes for formats, I have checked no-index for them, you can index them if you want. I recommend you no-index as shown below, you should disable them to save yourself from a Content Duplication penalty. In the next tutorial we will configure the Social part, XML Sitemaps, Permalinks, Internal links, RSS, and will look into the robots.txt file. Do you have any questions regarding this tutorial? Let us know. P.S. I tried my best to be as generic in approach as I could. You can find a lot of contradictory opinions about what I discussed, so to be clear once again, this is how I do things at my side, and I have been working with gigantic blogs and vast networks, these settings and configurations have proven to be great in my experience. « Do you know your personal information safe on facebook?